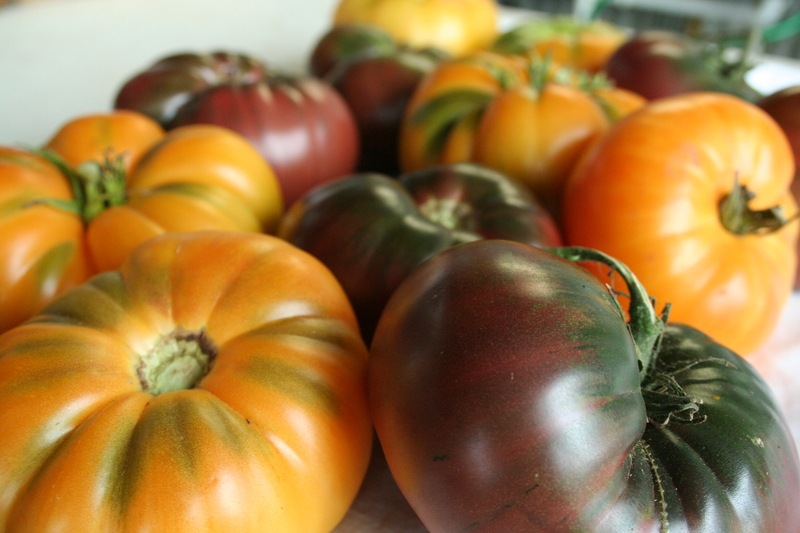 These beauties were a long time coming this year; and now, mid-September, we have rain again and the feeling of fall and it is hard to imagine how long this short lived tomato season will last. Not even as long as the equally short lived summer, I suppose. The rain feels lovely, but we couldn’t help but think how little time had passed since we were under the same skies all through June. Sunny, warm days for mostly just July and August is not much of a summer, and the tomatoes can’t help but be so, so, late and so, so, many fewer than we would like. It’s a bummer. Everyone loves tomatoes, they are key to many folks winter preservations, and they are, even though he doesn’t necessarily love to eat them unabashadly, the farmer’s favorite crop to grow. He finds them–well, all the big, many-hued heirlooms that is–beautiful. So, needless to say, he and we and all of us are dissapointed this year. But still, we are, as we are every year, grateful to plant such a diverse variety of crops here on the farm. Some crops have done better than they ever have for us, and some worse than we would have liked. And it seems like every year–regardless of short summers or below average winter temperatures or freak snow storms–this is the case. We can’t really get past the fact that this summer’s weather affected more than just the tomatoes in the grand scheme. It meant less food for the whole season, which means less farm income for the year, and that hurts regardless of the crops that did have a wonderful season. All around us, farmers with hay and seed crops and bigger, direct market operations are dealing with the same thing… and as always when it comes to the weather and farming, there is little we can do about it. And yet, we do all go forward, ready for another year, or in our case, for a great fall and winter, with still so much great food to eat, as many tomatoes as we would have liked or not. So we will relish what we have when we have it and cross our fingers for a mild, lovely winter. It seems only fair! great to meet you at the mcminnville market today! you DO have beautiful tomatoes, and caught me enviously eyeing them… and was really impressed with your veggie selection! keep up the good work, and the great blog! i look forward to seeing what you guys are up to in the future. crookedmoonmama, we are thankful for it too! nadine, andre mentioned that he met you today. we will have to take a look at your blog too!